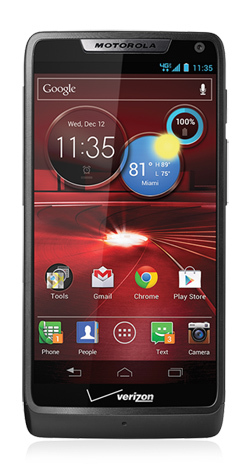 Looking at the Droid Razr M, it’s clear that Google and Motorola are good for each other. This $99 smartphone benefits from great hardware and software, resulting in a device worthy of the Droid moniker. With the 4.3-inch display on the Droid Razr M, you’d expect it to look and feel larger than it is, but Motorola trimmed the case so that it’s almost the same size as the new iPhone 5, which has a smaller 4-inch screen. The display provides a nice size for reading, surfing the web, and watching video. The 960-by-540 resolution can’t match that of the iPhone 5’s Retina display, but most users won’t miss it when they see the bright, rich colors of the Super AMOLED screen. Staying true to Motorola’s design, the Droid Razr M is industrial yet chic. Thanks to the size, most can fit the 4.4-ounce smartphone in their pocket and not worry about lugging around a bulky phone. Though slim, the Razr still has a microSD card slot so you can expand on the internal memory. Most will find this necessary since there’s only 8GB inside. Other than this, and the SIM card slot, the only other port is the microUSB connector for charging and hooking up to a computer. There is a catch: The battery is not user accessible, so you can’t replace it yourself if it goes bad. The Razr M will make a decent replacement for a point-and-shoot camera thanks to the 8MP lens on the back combined with a good camera app that offers advanced settings and features like HDR for more balanced photos. The resulting pictures are good but not great — not as good as the HTC One series, the iPhone 5, or even Samsung’s Galaxy S III. There are no physical Home, Back or Menu buttons on the Droid Razr M because it’s running Android 4.0 Ice Cream Sandwich. Later this year the phone will get an update to the latest version, Jelly Bean. 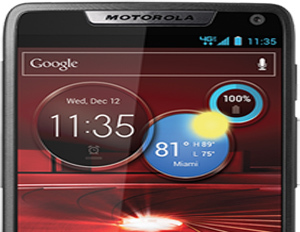 In the past, Motorola employed a user interface “skin” on top of Android called Motoblur. The Razr offers a mostly pure Android experience, though the manufacturer did add some tweaks. 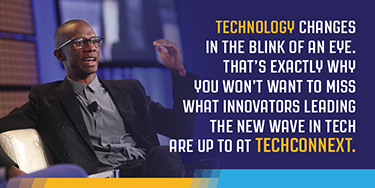 For example, swiping right on the main home screen reveals a Quick Settings screen that gives access to Wi-Fi, Bluetooth, and GPS radios, among other things. A widget called Circles dominates the main home screen, offering time, battery level, and weather. And Motorola made it so users can launch up to three apps right from the lock screen. Motorola and Google don’t offer any enterprise-specific features or security in the Razr M, so anyone looking to “Bring Your Own Deviceâ€ for work purposes may not get a favorable eye from the IT manager. The Razr M runs the operating system and apps smoothly thanks to its dual-core processor and 1GB of RAM. This isn’t a top of the line combination, but for people who don’t play graphics-intensive games on their phones, or are power users otherwise, this won’t be a problem. As it is, the Razr handled everything we threw at it, including heavy multitasking, without a problem. The battery life is very impressive considering that data comes from the power-hungry (but very fast) 4G LTE Verizon Wireless network. Motorola claims it will last for 20 hours with normal usage. We got about 12 hours with heavy use and none of the usual battery tweaksÂ such as lowering brightness, using Wi-Fi when available and limiting how often apps pull down data, so most users will probably be able to make it last longer. The Motorola Droid Razr M provides a powerful performance, beautiful display and long battery life. It’s available now through Verizon Wireless for $99 with a two-year contract.